We are taking many breaths and feeling the reunification underway in our bodies, minds, hearts and spirit. Gratitude to all who came and shared the container for last Sunday’s New Human transmission ~ I feel strongly the gathering up and Unity of this community. Yesterday, the midway point between 2 significant eclipses, I was called to a winding crystalline spiral called Bull Creek in the Swannanoa Valley. It is only about 15 minutes from my house – a beautiful, bubbling, pristine creek winding through a young forest that is very awake. I had on running shoes and had no plan to get in the water – then again, there is no such thing as a plan when following energy. The first curious thing that happened is that I began feeling and then singing a Native American song… it was not anything I had heard before and I do not speak any native tongue that I know of ;-), but the energy was very persistent so I just kept allowing, not judging, paying attention to what was going on in the reality around me. I felt a strong connection to the nature, the trees and growth around me through this song – I felt I was anchoring something. This went on for at least 30 minutes -again, it was not so much about the words or even melody – as the energy of what was occurring. This energy was working with me – and also with the nature around me. It was a memory being stirred. When I got to the creek – I jumped on stones to a raised rock bed in the middle – the creek ran softly over the top of these stones. I saw a tree about 6 feet away that had fallen over the creek – pointing toward a bend in the creek where I had never explored – and I explore a LOT – and often – even in these particular woods. So, I followed the tree’s path – balancing as I crossed over rapids and deepening water… I jumped off at the other end, thinking – ok, that is that because after all, I had on closed toed shoes! But no, the energy of the water was pulling me, the mystery beckoned me, all the river stones – lots of quartz, seemed to light up as if to urge me onward. And so, I just stepped off the tree, into the rushing waters and continued following the river (crystalline flow) – all the while singing this unknown melody with an unknown language – becoming less and less my identity aspect and more and more ONE with this moment and everything in it. Even now, I am aware that the details of this sharing and the words expressing them are secondary to the energy being conveyed here. I stayed with the creek for about 20 more minutes, very slowly and deliberately making my way through the mystery, to no place in particular. I stopped on some large rocks curiously positioned in the creek, deeply embedded in the creek bed, that lifted me above the waters surface. It was an exquisite setting, so vibrant and alive, fresh and new. I felt everything watching me – every tree had a different energy, the creek had multiple melodies and tones… I was drawn into the awareness of no beginning and no end as I tuned into the creek I had just followed and that which continued on around the next bend. Spirals, serpentine energy, living waters, harmonics that seemed to mimic the Indian song that so possessed me upon arriving in these woods. This song, this melody, was an attunement for my body, yes – but it was also a collaboration between myself and the nature kingdoms… and very feminine. I felt a powerful, rhythmic drumming – a cadence of feminine strength and power, I heard the voice of leadership, of authority… energy very rooted in primal knowing. It occurs to me now – as I stream the threads of this experience – that it wasn’t so much Native American in essence – that correlation was more for my mind, my DeAnne aspect. 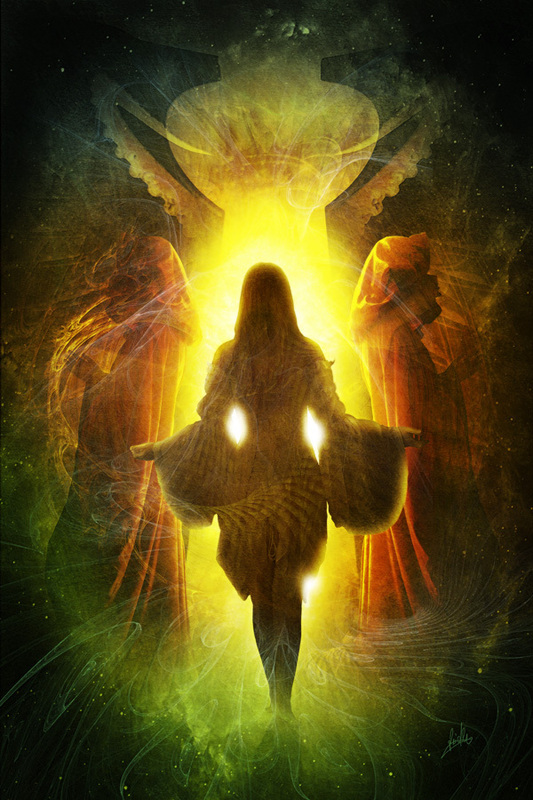 ACTUALLY – this whole experience and what was being conveyed was and is about the energy of Feminine Warriors. It reminds me of the mamma deer I talked about in the show… she was a female warrior: she was protecting innocence, that which is fresh and new to the world, she was defending what is not capable of defending itself. My brother commented that he was surprised this scenario didn’t involve mamma and baby bear rather than deer. But that would have never happened because this was a teachable moment – very much aligned with the ascending spiral of an evolving humanity. Bear medicine is about the subconscious mind – that is not where we are. Deer medicine is about luring into NEW ADVENTURE. And what this doe demonstrated is that the Divine Feminine is very fierce about boundaries – about what is and is NOT acceptable to this new timeline, to the frequencies of these new mental, emotional, physical and spiritual spaces… ( this will not make so much sense to you if you did not experience the 8/13 show!!!) The more aligned we are with the ascension spiral, the more attuned we are to this new energy and how it is influencing each moment – every experience in your waking reality – going to a movie, going to nature, the emails you get, the dreams you have – every little thing, is going to be communicating the same thing! The Rise of the Feminine, working with feminine awareness versus masculine understanding, restoring balance, all things inclusive in nature – the threads of pain, of separation, of threat and violence diminishing while those of Peace, Harmony, Love and Unity expand as a flood light across our world, within our Earth and inside our hearts. I went to the Shining Ones vortex today… high into the upper tiers of the New Feminine that we will be exploring in the Fall Equinox Retreat. There was an eerie stillness, time kept slipping in and out dimensionally. I made it to the top in half the time it should have “logically” taken. Once there, it began to pour. I later discovered it rained NO WHERE ELSE than in those woods, while I was there. Bodhi and I perched beneath a giant rock being, sheltered from the 3D effects yet marinated in the crystalline showers of a very pure love, a very active ascension, a very palpable feminine presence. This stopping of time, this command of weather and very alive, background activity of zero-point energy… these are our Ascension Gateways, opening pathways to New Earth and beyond; they penetrate and override time dynamics. Breathe and feel it when you notice this occurring; familiarize yourself with Gateway openings so you can identify them easily. Several options of experience are presenting; a fractal explosion of possibilities as the planetary consciousness releases itself from density. This is an exciting, wondrous moment for New Human Starseeds and Wayshowers in service. Our crystalline DNA encodements will be vibrating with multiple star lineages in order to create a resolution effect of the lower experiences, which reveals the new co-creation of Source intent on a larger scale. I AM guided to offer another Unity Meditation this Sunday – once again @ 11:11am eastern. Don’t get hung up on the time – it is serving as an anchor – it is your intention that will connect you into the Unity and community of this experience. Bring your love, your Higher Self, your purest vision ~ along with the intention for peace, harmony, balance, healing and Ascension. We will gather in support of the collective HUman Heart grid – allowing the pure vibration of the Divine New HUman to radiate out to willing participants while surging Ascension codes through the grids, Gaia, and all of Creation. This is WHO WE ARE – I AM SO SO GRATEFUL. We Are Oneness Rising. We know one another through all time and space – we agreed to BE HERE NOW – knowing the gifts, the sovereignty, the wisdom and POWER we have to bring to this massive activation. Open your hearts to it New HUmans, raise your light quotient, visualize and feel the connection we all share, invite this Love in to support your highest magnificence, accept nothing less. I will close this energetic, already so full ~ but please take time to read the latest intel coming in about the Fall Retreats. I will send that in an email shortly! Everything so connected – in support of our highest good. I AM Divine Light. I AM Divine Love. I AM Divine Will. I AM all that I AM. Divine Love to all during this beautiful and transformational phase of our Ascension. Remember to get outside often, connect with the SUN, the trees, the waters… and keep your heart creative, open and willing to explore the unknown. As the Shining Ones revealed last month… keep your Solar eclipse plans simple; allow space to focus and receive the Divine Light activations on behalf of the collective. I LOVE YOU ALL – SO VERY MUCH! Always in my heart ~ we are ONENESS RISING! Shanti Shanti Shanti ~ and all her paths are peace. Loved the video. So many wonderful energies. Thanks for sharing it with us. Gratitude from the Earth, the Shining Ones and me ॐ??????? ?